Following a lovely busy Christmas and New Year (with bookings already being taken for Christmas 2016), we would like to thank all our customers for their loyal support, as well as our staff for their hard work over the hectic Christmas period. 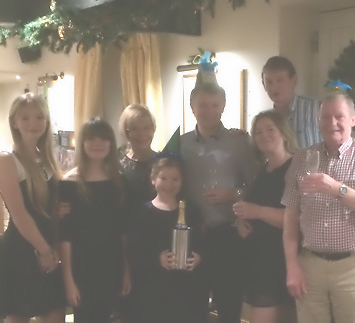 Congratulations to the ever engaging Foyster Family for snapping up the New Years Eve Champagne by winning this years’ annual picture quiz and to Mr. M. Parish for winning a free night B&B in our Grand Christmas Draw. Further prizes of a £50 restaurant voucher are won by Mr. M. Witley and a bottle of Champagne by Mrs. A. Davies. The year ahead promises even more exciting times for the King William team, marking a fantastic 180 years of King William Hospitality with 11 years at the helm ourselves. Celebrations are on their way – watch this space. But first we kick off January with a variety of refurbishment projects for bedrooms and public bathrooms to maintain and improve our facilities. In January we see the return of our popular reward vouchers where you will receive a £2.50 voucher for every £25 spent (to be used on your next visit within two weeks of the issue date). What better way to beat the January blues than a delicious meal in one of the four designated dining areas, whether cosying up in the bar, in front of the roaring log fire or unwinding with the family in the child-friendly gallery restaurant? We hope to welcome you and your friends in support of the Astro Brain Tumour Fund at our Pie, Mash & Pudding Night on Wednesday 20 January. An excellent raffle will be held to raise further funds for this hard working charity. If you haven’t booked a table yet, please do so today for this very worthy cause. As always, we look forward to welcoming you at The King William and hope you enjoy your visit. Cheers to a Happy & Healthy 2016! This entry was posted in General News on January 5, 2016 by Lili Skerritt. Thank you for making our stay with you very enjoyable. Nick and his friendly and helpful staff made our visit all the more enjoyable.